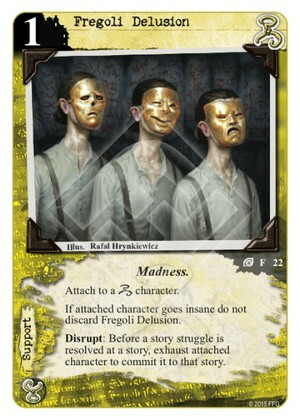 Attach to a [Hastur] character. If attached character goes insane, do not discard Fregoli Delusion. Disrupt: Before a story struggle is resolved at a story, exhaust attached character to commit it to that story. Very good to commit a character right before arcane, after the danger of combat has passed. This could be a major tool for Hastur to circumvent one of its traditional weaknesses. How does this card work? If it is not discarded, does it stay attached to the insane character, or is it available in play to be re-attached to some other character with the same controller? I think this card is the BFF of Ardois-Bonnot.